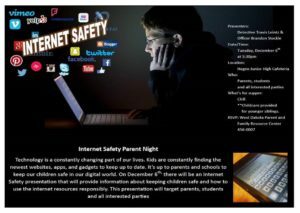 The Dickinson PD is hosting an Internet Safety seminar for the public on Tuesday, December 6th at 5:30 PM in the Hagen JR High cafeteria. A chili supper will be provided, as well as childcare for younger siblings. This is a great opportunity for parents and students to learn about using the internet safely and some of the biggest concerns that law enforcement sees regarding internet resources. This seminar is free and open to the public.